Join master musician and renowned Sufi teacher Pir Shabda Kahn for a joyous and heart-centered weekend of Dances of Universal Peace, Sufi Practices, teachings, sitting meditation, the Walking Meditations of Murshid Samuel Lewis, and Zikr. Come, and experience these multi-cultural practices that awaken and touch the Spiritual Essence within ourselves and others. For more information click here to download a flier. Murshid Wali Ali Meyer is a gifted teacher and guide in the journey of awakening. He is the director of the esoteric school of the Sufi Ruhaniat International and is a master teacher of the Walks of Murshid Samuel Lewis and the Dances of Universal Peace. Wali Ali carries the blessing and transmission of Murshid Sam, the founder of the Dances of Universal Peace. Wali Ali received an M.A. in Philosophy and Theology from Vanderbilt University and edited many of Murshid Sam's published writings. It brings him great joy when he can share the power of love, which is awakened by Grace, and see the face of the Divine Beloved in all. Currently he is co-authoring a book on the Beautiful Names of God, exploring ways to work with the Divine attributes or wazaif to overcome the soul's sense of separation from God. Join master musician and renowned Sufi teacher Pir Shabda Kahn for a powerful journey into the Way of the Heart. This beautiful workshop will offer the opportunity to discover or deepen your experiences of the profound teachings and practices of Sufism, and experience the Sufi Message of Love, Harmony and Beauty. Join us as we offer an experiential exploration of our attunement to our life through the Dances of Universal Peace, Sufi practices, teachings, stories, the Walking Mediations of Murshid Samuel Lewis, and Zikr. All welcome!! Click here to register online The workshop is currently full. If you register online, we will add you to the waiting list and contact you if space becomes available. Thank you! Sponsored by One Sun San Diego Sufi Circle. and to have heard his words in the Aramaic he spoke? How would our hearts have been touched? What would we have understood? This study group is an opportunity to open ourselves to the living spirit that still speaks to us today. We will use the Aramaic version of the Lord’s Prayer/ Our Father as presented in Prayers of the Cosmosby Neil Douglas-Klotz, Ph.D. as the beginning point of our journey. * Other complementary resources may be added from time to time. At the end of the series, we will put together all we have learned and dance the whole prayer in one evening. You are invited to join us! I hope you can come! Dates: 1st Monday of each month. Directions will be given when you register. No one will be turned away for lack of funds. Please call. 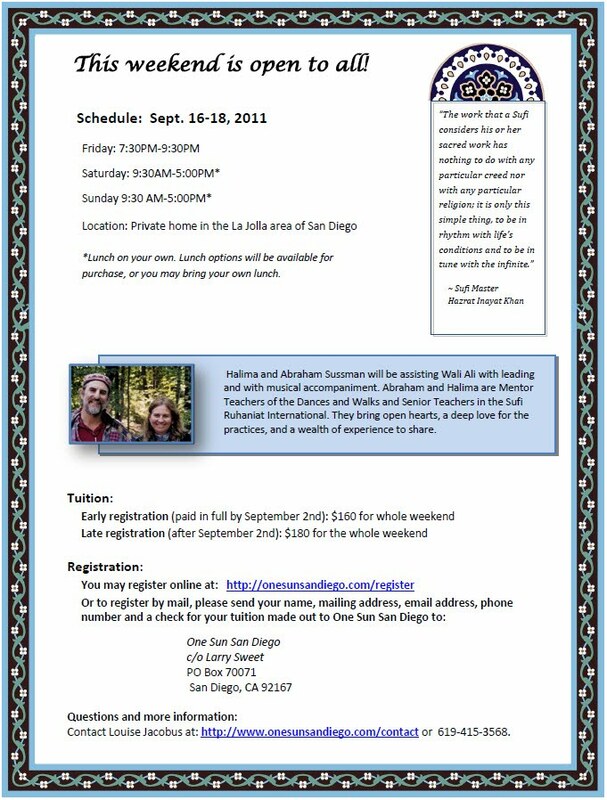 One Sun San Diego Sufi Circle, an interfaith esoteric school. Rejuvenate the spirit and awaken the heart through the Dances of Universal Peace, accompanied by singing, stories, and practices from the universality of the world's mystical traditions. drawing, movement, sculpture, humor, or poetry. and facilitating heart-opening events for over 40 years. After encountering Murshid Sam Lewis and studying with Wali Ali Meyer, he started leading at the Lama Foundation, then led while traveling with Ram Dass. At present, he teaches in Northern California and travels extensively to teach around the country. Tui has an M.A. in Humanistic/Transpersonal Psychology, and a Ph.D. from the California Institute for Integral Studies. He is a senior mentor of the Dances of Universal Peace and a teacher within the Ruhaniat Sufi tradition. 4190 Front St, San Diego. Some GPS have trouble finding this address. Try '"Intersection of West Arbor Drive and Front Street"
(Parking lot entrance is across from UCSD Medical Center on West Arbor Drive. FREE PARKING PASS available at parking lot or dance meeting. A separate donation of $10 is requested for the dance meeting. backyard. Beverages and snacks will be provided through the day. We can email you a pdf of the workshop flier or mail you a paper copy of the flier. Jesus as a teacher of spiritual awakening. for a flier to be emailed to you. but as living guides for awakening and embodying Love in our lives.